We’ve seen several studies like this over time and many of them were identified by the Quantifinder on Monday. With so many studies confirming each other, it seems the downside edge in these very low volume rises is for real. One caveat with Monday’s action though is that it was Yom Kippur, meaning a lot of traders were out of action and somewhat lower volume could be expected. Still, it’s been a steady enough edge that I decided to it was worth review. One hint from Friday that suggests a bounce is likely is the fact that volume came in very low. It was the lowest volume in over 2 weeks. Below are some tests which demonstrate the potential importance of this. First, let’s look at 3 day pullbacks that don’t occur on extremely low volume. As you can see there is a slight upside edge. The % winners were between 57% and 60% and the average gains days 1-3 were between 0.1% and 0.275%. Here the upside edge is significantly stronger over the next few days. The % winners were between 68% and 76% and the average gains days 1-3 were between 0.59% and 0.94%. The reliability of a bounce occurring at some point in the 3 day period increased from 75% to 87%. Volume can often provide some valuable clues. For more volume-related analysis, you can check out the volume label on the right hand side of the blog. It appears Wednesday's action suggests bullish implications over the short-term. 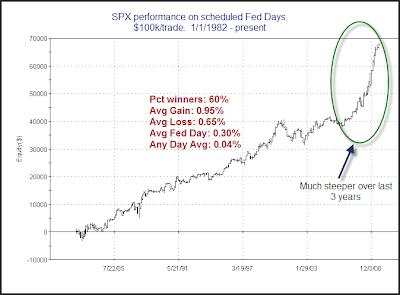 Below is a long term chart of market performance on scheduled Fed days. I didn’t include non-scheduled meetings. Those are generally surprise rate cuts that are aimed at boosting the market. They’re inherently bullish yet unpredictable since the meetings aren’t scheduled. Therefore there is no point in including them in this study. Over the last 27 years there’s been a persistent upside edge. The average Fed day has ourperformed the average day by about 7.5 times. For more studies on Fed days make sure to check out the Fed day link. Never Have So Many Stocks Been So Stretched Above Their 200ma. 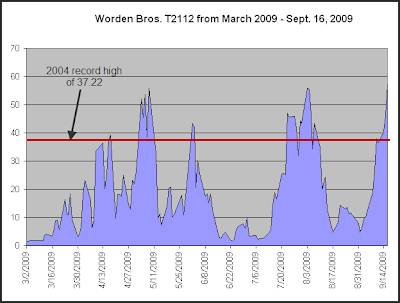 Near the end of August I discussed that some of the breadth measures tracked by Worden were near all-time highs. This situation corrected itself as the market embarked on a brief selloff. Tonight two of their indicators actually registered their highest readings ever. 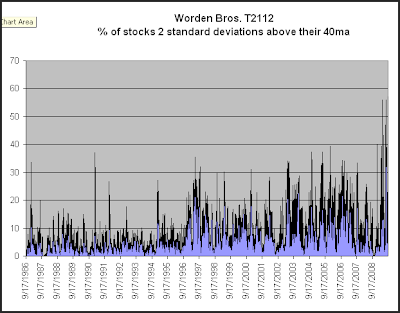 These are T2109 and T21111 which track the number of stocks 1 and 2 standard deviations above their 200-day moving averages. 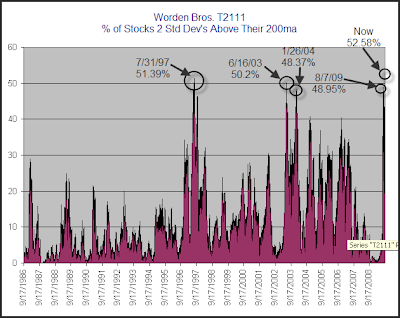 Below is a long-term chart of T21111 with full history of the indicator going back to 1986. I marked on the chart the 4 other instances that came close to the current reading. What you may notice is that these spikes were generally brief. Every case was followed by at least a mild selloff that worked off the severely overbought conditions. In no case did the extreme spike mark the end to the bull market that created it. It’s dangerous to read too much into only 4 instances, but a short-term pullback does seem reasonable. The current reading does not suggest a long-term top, though. Today I just want to touch briefly on the exit parameters for the “2 Days In Chop” systems that I discussed yesterday. The exit strategy is basically a time stop married with a “first profitable close” exit. For many traders, a “first profitable close” exit may seem like nothing more than a ploy to inflate the winning % of the system and not an appropriate exit technique to put into practice. Sometimes this is true. In other cases though, the 1st Profitable Close exit is appropriate and effective. “2 Days In Chop” is one of those cases. Recall the premise of the system was based on taking advantage of the extremely choppy market conditions that had been identified. It’s those choppy conditions that make the 1st Profitable Close strategy viable. When conditions are especially choppy and the market is constantly swinging back and forth, the expectation is for that chop to persist. This would suggest a move in the direction of the trade is more likely to be reversed than to follow through. 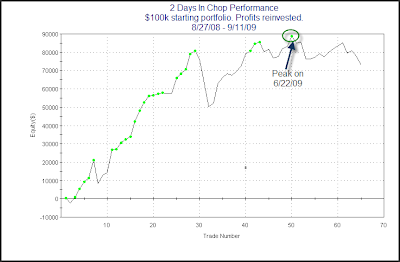 So with a system like “2 Days in Chop”, the expectation flips as soon as the trade becomes profitable. Since a reversal is more likely than continued follow through the correct play is to take the quick profit. Obviously an exit strategy like this only works well when trading a reversal / mean reverting system in a choppy environment. In a different environment, or if trading a breakout system, an exit strategy that looks for quick profits would be a disaster. Other techniques that work well when trading overbought/oversold conditions would include using a short term oscillator and waiting for that oscillator to revert back to a neutral state, or using a short-term moving average (such as a 5-day) and then exiting the trade on a cross of the moving average. 1) Buy the SPX any time it closes lower 2 days in a row. 2) Sell the 1st profitable close up to 3 days later. 3) Sell on the 3rd day regardless of profitability. 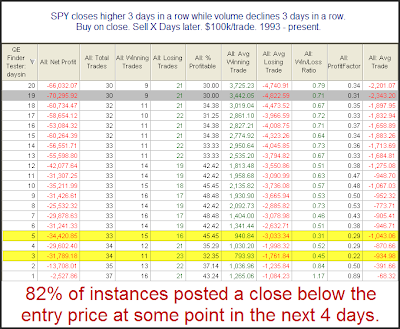 1) Short the SPX any time it closes higher 2 days in a row. 2) Cover the 1st profitable close up to 4 days later. 3) Cover on the 4th day regardless of profitability. At the time the market was locked in a downtrend which is why I gave the shorts an extra day. I noted the systems were very raw and were not something I would trade “as is”. Below I will show the combined performance of the 2 systems since I introduced them. In upcoming posts I’ll discuss how I use the systems and also discuss some thoughts on them and some ideas in which the basic systems could be improved. Here is the performance over the last year +. A 73% return would seem very impressive for something so simple. It has had a bit of a drawdown lately, though. Below is a profit curve. 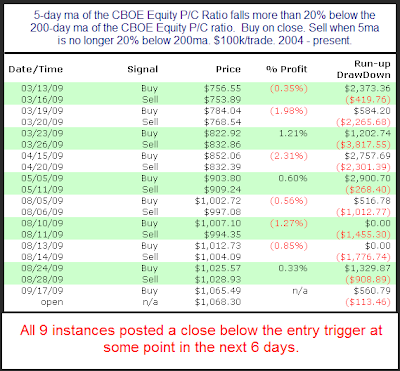 The system peaked on 6/22 and has had a few rough trades as of late. Still, the recent drawdown is very small compared to the overall gains of the system. So why haven’t I simply traded the system “as is” for the last year? I guess you could say that I’m just not smart enough to blindly trade a system this dumb. I’m getting a little smarter, though. And I’ll have more in upcoming posts. This setup appears especially bearish over the 1st week. Possible bearish implications extend out much further than just a week, though. Would you like to be made aware any time this setup triggers in the future? The Quantifinder does it for you! Versions of the Quantifinder are available with both gold and silver subscriptions. As I ready to publish this I see that Cobra also noticed this pattern last night. Check out his take as he identifies several recent occurrences on his chart. From a seasonality standpoint, Labor Day week has historically been a bit weak. Tuesday through Thursday have shown risk/reward to favor the bears, though whether the market is up or down has basically been a coin toss. If we look at times like the present where the market has made gains in the weeks leading up to Labor Day, you’ll find the implication is a bit more bearish. This isn’t the most compelling edge I’ve ever published, but for a study based primarily on seasonality, it’s not bad. Labor Day is the last day to take advantage of the Dog Days of Summer promo. Sign up for an annual subscroption to Quantifiable Edges Gold, Silver, or Triple Play packages and receive the Q1 2008 Studies Package ($195 value) free! Offer ends 9/7/09 at Midnight. Is Thursday's Low Volume Troubling? In last night’s Subscriber Letter I examined whether the relatively low volume on Thursday’s bounce should be concerning. I examined it a few different ways. Below is one series of tests I showed. First let’s look at what happened when volume came in higher on a bounce following some severe short-term oversold conditions. Here the results have a solid bullish tilt. These tests suggest that Thursday’s light volume should not be of any concern. In fact, it may be a market positive. 16 for 16 bouncing at some point in the next week suggests a pretty good chance we see a bounce here soon.